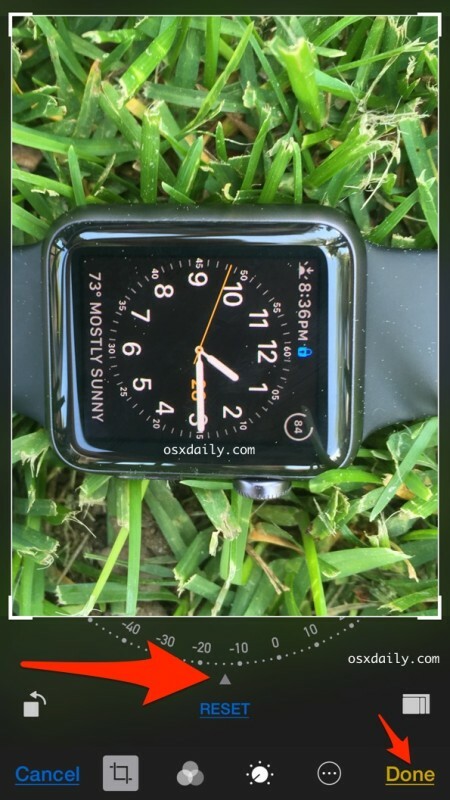 Just about everyone has taken a picture that isn’t lined up quite straight, but iOS offers a nice simple way to quickly straighten any photo by tilting the image by a small degree. Whether an image is completely askew or just slightly tilted, you can can quickly correct the image and straighten it right within the Photos app on iPhone, iPad, and iPod touch. Do note that if you’re needing to dramatically straighten an extreme tilt, the image will be slightly cropped in the process. You’ll get a preview of this as you rotate the image though, giving you live feedback as to what the image will end up looking like at any level of tilt correction. The straighten tool is also where you can crop images, or if the image is completely sideways, you can rotate the image as well in 90 degree increments too. Many third party photo editing apps for iOS also offer a similar feature, but with it being built into the native iOS Photos app it’s usually more than sufficient to utilize what’s already on the iPhone or iPad this way. 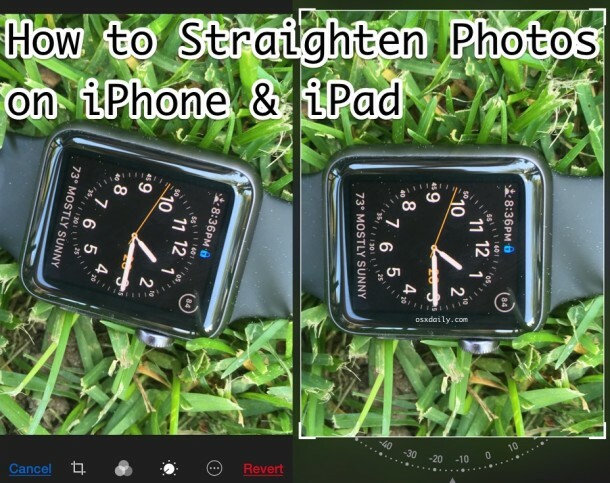 The straighten image dial is only available in modern versions of iOS, if you don’t see the option and tilt dial in your Photos app Edit screen, you likely need to update software. This really works. I was cropping a picture and it automatically aligned the horizon. I didn’t try to do it. Perhaps it can sense photos with a well-defined horizon? That “sample” is clearly Photoshopped though. To straighten an image, it has to zoom in a bit to mask the empty edges. It’s showing MORE grass on the top right and bottom left that was never in the original image to begin with, so it doesn’t just automatically show up when you rotate it. Yes, it works, but it doesn’t work like the image shows it will. These are screenshots taken from the iPhone Photos app in Edit mode using a picture taken with iPhone camera, it is not photoshopped. The arrows are added with the Skitch app, though. Do I really need to transfer them? Do you have “how to” steps in order to do this if I need to us Photos app. 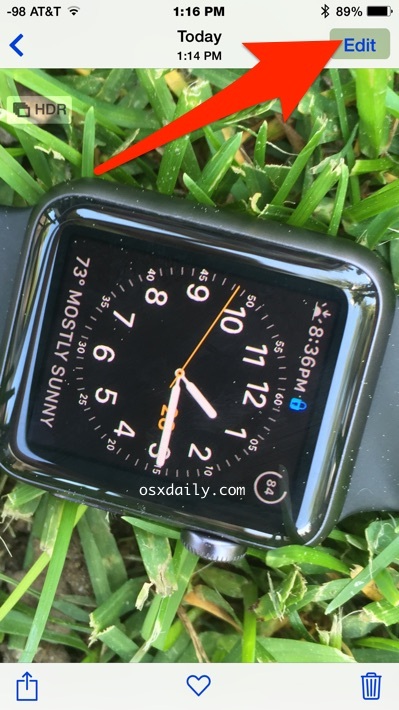 Yes you can rotate photos like this in Photos for Mac. But, this is an article about straightening pictures you take with your iPhone camera, using the iPhone Photos app. That has absolutely nothing to do with straightening photos taken on the iPhone with Photos app. I like broccoli, for example. Good, goes with all sorts of food, but also totally unrelated!